Cityscape Global, the largest real estate exhibition and conference in the Middle East, is back for three days this week from October 2 to 4. It gathers all real estate stakeholders – developers, brokers, end-users, investors and suppliers – from the UAE as well as the wider region under one roof. As such, it acts as a barometer of the market sentiment. It was reported that over Dh870 million worth of on-site transactions were recorded during the three days of Cityscape Global in Dubai in September 2017. Analysts expect similar levels of interest this year as developers are increasingly becoming competitive in their product offerings. Apart from new launches, the event is likely to see a focus on ready properties, with developers trying to clear their inventories. “Cityscape is a seminal event in the Dubai real estate industry. In the run-up to Cityscape every year, there are launches that are announced, as well as a raft of measures that regulators and the government offer for investors and end-users alike. This year will be no different. From a sales perspective, it is likely that while there will be new launches, there will be a greater emphasis on ready properties and the incentives associated with it; and greater direction on where the industry is headed post 2020 and what the new initiatives will be vis-a-vis ‘smart housing’ and the like,” says Hussain Alladin, head of IR and research at Global Capital Partners. The consultancy Core estimates that there is historically a 15 to 25 per cent spike in transaction volumes in the fourth and first quarters compared to second and third. “Many factors influence this trend, including new launches over Cityscape, deals from developers, seasonality and close of financial year for businesses/institutions/investors,” says David Abood, partner at Core. As a meeting place for the realty sector, Cityscape sets the tone on what to expect for the coming couple of quarters. With sales being allowed on the exhibition floor, developers and brokers agree that Cityscape generates a lot of new qualified leads, not only for the quarter but also for the whole year. Incentives such as waiver of Dubai Land Department fees, lower acquisition prices, special Cityscape discounts, post-handover payment plans and other attractive deals are expected to be given over the course of the exhibition to clear developer inventories. “The consumers are spoilt for choice with offers from all participating developers. It also helps to make an informed decision, after talking to so many developers that showcase their projects at the same venue,” says Rahman. Whoever offers a good product, innovative payment plan, delivery and guaranteed return on investment is likely to resonate among buyers. For instance, Sun and Sand Developers is offering a unique ‘exit option’ for buyers at its new project, Suncity Homes in International City. “We want to ease the fears of first-time buyers. The exit option will allow buyers in genuine difficulty to make use of every cent paid towards their purchased unit through benefit options of either; (1) a rent-free plan for a maximum of three years, or (2) a cash-back plan from the rental income of the apartment,” informs Israni. 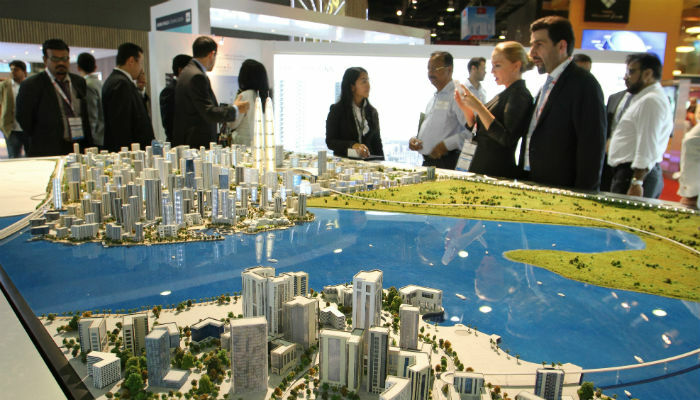 Exhibiting developers are likely to focus on project completions at Cityscape as leverage to launch new products. “We expect major UAE-based developers to launch new projects/phases while also exhibiting existing projects,” says Core’s Abood. “Every developer will be in a different cycle with their projects. Timely completion is important for a developer. Hence some may focus on delivery. Others who have no inventory will have to develop new projects,” Israni concludes.